Squamish Nation dance group Spakwus Slolem were one of many groups to perform during the Coastal Dance Festival this year. Submitted photo. Diverse Indigenous dance groups from as far as Australia performed during this year’s Coastal Dance Festival in the Lower Mainland. The 12th annual festival — formerly called the Coastal First Nations Dance Festival — showcases Indigenous dance, stories and songs from Canada and beyond. This year’s event featured dancers from B.C., Quebec, the Yukon, Australia and Washington State. It ran from Feb. 20 to 24 at New Westminster’s Anvil Centre in Qayqayt territory. Margaret Grenier is the producer and artistic director of festival through her Northwest Coast dance company Dancers of Damelahamid. Grenier said the festival always showcases diverse talent, but this year there was a special focus on empowering women. “There are a number of (dance) companies that have a very strong female leadership,” she said. Grenier said that includes her mother, Elder Margaret Harris, who co-founded Dancers of Damelahamid and was recently inducted into the Dance Hall of Fame. The event also included performances from Indigenous women from Australia’s Blue Mountains and Central New Wales west country, a place where a lot of Indigenous dance is typically focused around boys and men. The festival also included a performance from Montreal-based Indigenous singers Émilie Monnet and Nahka Bertrand, and the Dancers of Damelahamid debuted an excerpt of their newest work, Mînowin. 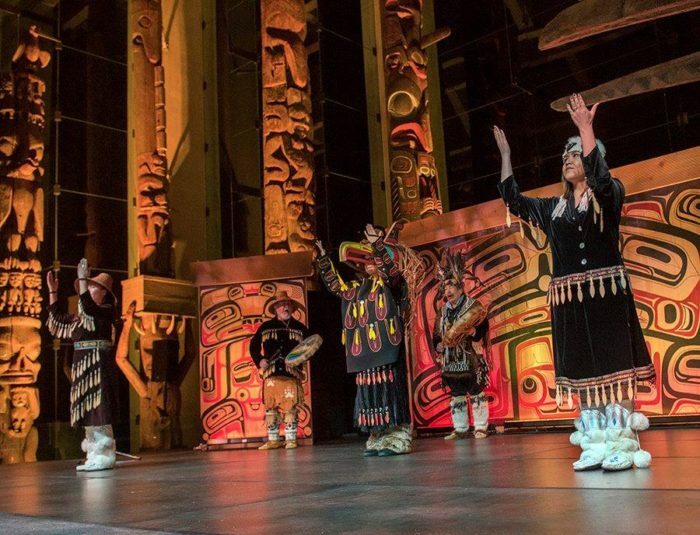 Grenier said the festival began as a way to showcase Northwest Coast dancers but has grown over the past decade to include performers from around the world. She said, because the festival takes place Coast Salish territory, organizers are sure to feature Coast Salish dancers and get advice from local elders while the events are being planned. This year, Squamish Nation dance group Spakwus Slolem performed songs and dances representative of their canoe culture. Squamish Nation’s Mathias Entertainers also performed. “It’s really important to us because our home territory is not in the Vancouver area,” she said. More information about the festival can be found at http://damelahamid.ca.